Accusations of inadequate transparency have tarnished Denver Public Schools’ efforts to select a school operator for a controversial new southeast campus. The planned elementary school at Hampden Heights, where construction started in January, has for months been at the center of public disputes between neighbors and DPS, including a lawsuit over land acquisition scheduled to be argued in Denver District Court in May. Three applicants — charter school Rocky Mountain Prep, an expeditionary learning school, and a traditional neighborhood school — are vying to occupy the new campus. The Denver school board will pick the winner in June. But some area residents accuse the district of having settled on the Rocky Mountain Prep charter, before the community has a chance to provide input and an official process can take place. It’s an accusation school district officials have been quick to counter, saying DPS systems for selecting new schools have been overhauled to remove any possibility of favoritism. But charges of sham transparency have proved difficult for the district to counter. Most recently, the district has faced controversy over a new high school in Stapleton. And recent years have seen conflict over new schools at the North and West High School campuses and in the Far Northeast. Debates across the city have been punctuated by accusations against the district of insufficient communication and favoritism for charter networks. But district officials say they have recently transformed the process for selecting new schools and identifying facilities for them. “We’ve worked pretty hard in the past year to get clearer and clearer about facilities decisions,” said Alyssa Whitehead-Bust, the district’s chief of innovation. As for the accusations that the district had already selected Rocky Mountain Prep for Hampden Heights, Whitehead-Bust said that the new procedures the district has implemented make that impossible. She cited praise of the district’s procedures from national groups, including the National Association of Charter School Authorizers. Still, the perception at Hampden Heights lingers that Rocky Mountain Prep, a high-structure charter school, is a shoo-in for the campus. Other parents and community members echoed her sentiment, saying that Rocky Mountain Prep appeared to be the district’s favored applicant. And the charter’s own actions may have exacerbated those feelings. The school recently posted a job listing for a “Founding School Leader: Hampden Heights Campus.” They have since changed it to the more generic “Founding School Leader: Second Campus” (an archived copy of the original posting is available here). 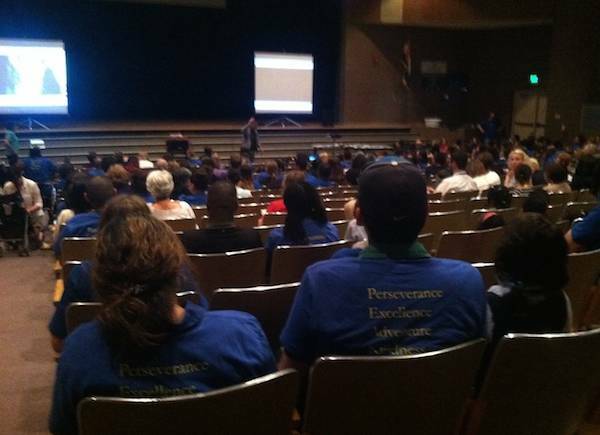 Also, current and prospective Rocky Mountain Prep parents and students showed up en masse to the last community meeting in t-shirts emblazoned with the charter’s logo. But Rocky Mountain Prep’s leaders say that if something’s been decided, they haven’t heard. And the posting went up, they said, to ensure they have a strong leader if they do get approved. And some say the politicized environment surrounding Hampden Heights, where the district has already battled accusations of back room dealings over the acquisition of the land, is the real reason for the lingering suspicions. This entry was posted in Hentzell Park Update and tagged charter school, Denver Public Schools, Hampden Heights, Rocky Mountain Prep, Trust issues. Bookmark the permalink.